These fancy mouthpieces that Lil Wayne and Birdman sport aren’t cheap by any means. What they shelled out in cash to buy one, is equal to that or more than what the average person might pay for a home. It has been reported that Lil Wayne has quoted his designer teeth to cost him around $150,000. Even more than that, The Birdman has been heard telling those that are curious about his dental work that he paid around $500,000 all together. One may ask why in the heck would they spend so much money and what exactly did they spend it on. To answer the first question, these two music moguls are rolling in dough. Being the co-founders of the Cash Money empire, the two of them rake in millions of dollars every year from music projects they have done themselves or that of other artists signed to their label. With Lil Wayne branching the Cash Money Records label out into Young Money, he has helped to increase profits significantly. His net worth was recently reported at $95,000,000. Recent reports also show that Birdman’s net worth is around $110,000,000 so these two hip hop veterans have mucho dinero to spend. The answer to the second question of what is in these six figure grills, lies in the finest jewelry that money can buy. These designer teeth are encrusted with gold, platinum and fine diamonds to say the least. 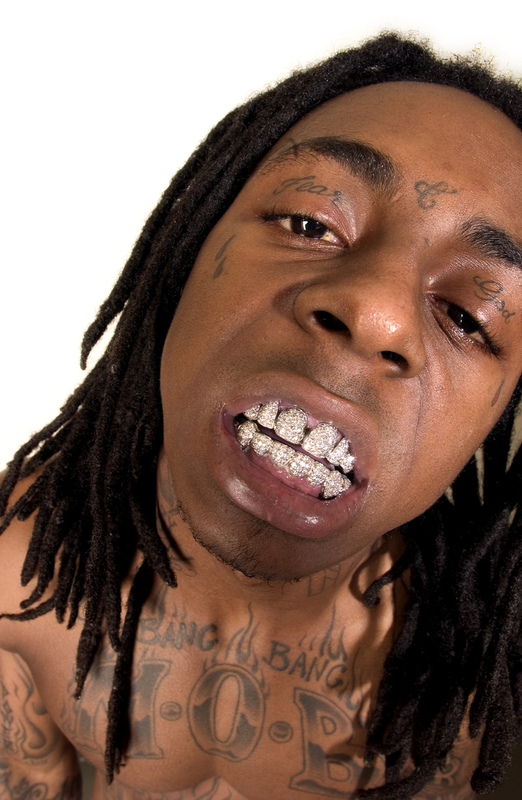 Images of Lil Wayne show multiple diamonds studded on every tooth of the grill giving him that “bling, bling” smile. There are reports that Birdman’s teeth include 18 karat white gold along with platinum crowns set with asher cut diamonds. The thing about these grills is that they’re not pop out accessories. These grills are supported by their actual teeth. For the average person wondering about how they can get a grill that looks anything like Lil Wayne’s and the Birdman’s, there are plenty of look alike jewelry accessories that don’t cost nearly as much that can be used. For the ballers who are looking to “keep it real” and shell out money for genuine jewelry, they will have to pay a pretty penny as well. It’s not necessary to spend as much as these music moguls to get the bling effect but one will have to cash out if they want to get the real thing. It’s important to note that since these grills are permanent they were put in by a professional in the dental care industry. Using a professional to install teeth will certainly add to the cost of getting a sparkling diamond and gold grill.